For some reason I’ve never met an aggregator that I like. I don’t like to paw through large lists of headlines and bounce between a reader and a web browser. My ultimate aggregator would help me classify by subjects, feeds, headlines and weight them based on my reading habits. Does something like this exist for Mac OS X? I’ve noticed there are a handful of RSS reader extensions for Mozilla. Does anyone have experience with them? I had planned to write a few glowing words about Apple and their stellar repair service. 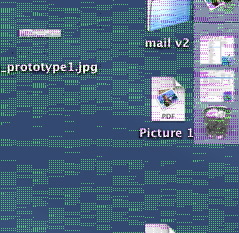 My Powerbook has developed a display problem over the past month. I called Apple support, talked to a very helpful support tech and he diagnosed my problem quickly. It seems I needed to have my logic board replaced. Okie dokie. So Apple shipped me a box and I packed my computer into it. I dropped the computer off at Airborne Express at noon last Wednesday and I received it back on Friday afternoon – just two days later. Talk about turnaround time! This is where my glowing words fail to actually glow. The problem is, the Powerbook isn’t fixed and still has display issues. Here’s a recent screenshot [PDF] of what I’m seeing. I called Apple today and arranged to have my Powerbook shipped back to Texas for further fixing. I wonder, does Apple put more effort into getting the repair done fast over getting it right? Lest you think that I only base this question on one experience: My girlfriend recently had some problems with her iBook’s keyboard and it took three tries before Apple actually fixed it.